Perfect pies come up the Valley that’s the ver­dict of the Pork Pie Appreciation Society. The Pie Club, which meets every week at The Bridge In Ripponden, has named two Colne Valley butchers as top pie makers. Members of The Pie Club, founded in 1984 by eight friends, have given top marks to Golcar butcher Stuart Booth and Knights butchers of Marsden. Pies are judged on crispness of pastry, well seasoned filling, quantity of jelly and freshness. Some Pie Club members have become such con­noisseurs they claim they can tell whether pies are from a baker’s or butcher’s and exactly when they were baked. Golcar butcher Mr Booth who has a family business well established in James Street, said his secret for a good pie rests with the seasoning. 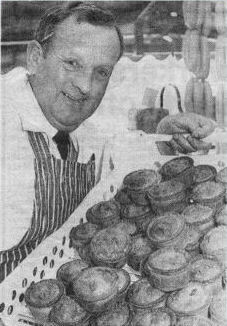 Pies are made daily on the premises and Mr Booth is aware that Pie Club members test his pork pies from time to time. Marsden butchers A and E Knight of Bridge End have been in the pie making business for 11 years. Robert and Elizabeth Knight make their pies on the premises following a recipe which they believe makes their products popular locally.